So, finally….titling my cup towards your domain, and starting to blog! I guess, expecting the reverse – hoping that you tilt your cup/goblet/chalise/mug towards my domain (kaushalmahajan.com) and kill some time (at the least). Have had a few sincere and a few casual and a lesser few sarcastic requests to start blogging all over the past years, and given that I have time to kill, thought why not. And what better topic to dribble over the keys than football! I love the game and do harbour delusions of kicking around a bit. 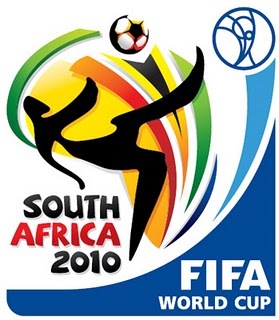 And now that we are in the KO stage – let the real World Cup begin. 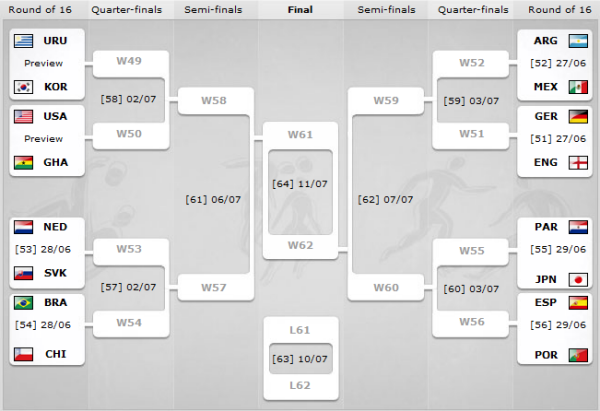 So heres how the sweet sixteen line up against each other. Its one of the craziest round of 16 thats come about and like any long suffering football lover, I hazard some predictions – some that are obvious and some putting my foot in my mouth and scoring some goals. Since a large section of this blog is also going to focus on investing psychology, I wanted to relate the process of issuing predictions to the whole quirky experience of placing money behind bets in the real world of bulls and bears. 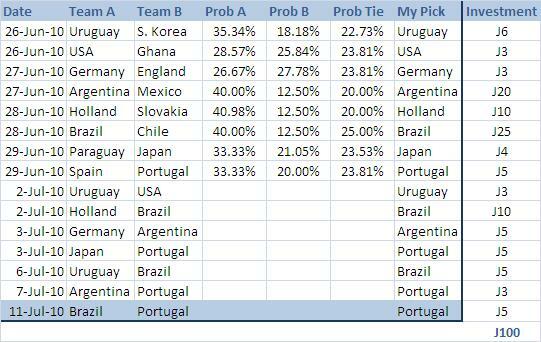 So the second part of the post attempts to stick my neck out, make predictions and put money (in hypothetical currency – lets say, Jabulani units) behind each bet and then lets see what happens as the sixteen start their square dance (never mind that the pitch is not square). With the Euro being what it is and the honourable exits of the EU teams, I guess the Jabulani (or the Jabu, as a short form) might just be a better currency! Almost everyone is saying this, offering some digestives alongside – one of USA, S. Korea, Ghana and Uruguay will fill our vision on 6th of July semi-final. nice. No more than one European team will make it to the semi-finals this year. Despite better club level playing structures and more money (again! ), is this a portend of at least the football switching sides at half-time? The ball rolling away from Europe to other “emerging” pitches? There’ll be a lot of fretting and fuming on some refreeing decision. FIFA will still look the other way when replays are shown to them. I hope your favourite(s) do not become the victim(s) of such intransigence. Expect more surprises. I picked up this line from the web – that the round of 16 is the real world cup – thats when the real serious boys start kicking around. I don’t know – maybe that view is being fuelled by a feeling of disbelief that some of the marquee names that have departed were dealt the unluckiest cards by the hand of God. Not so – I think all teams that are in the 16 have played good and have reasons to be there. So, I predict a few more upsets (ok. at least two?). Question is – are you willing to bet on it? How many Jabulanis are you willing to lob on an upset happening? Real money? This is what I think. The probabilities of winnings are as per the odds for each outcome offered at Ladbrokes on their home page, which may well be a proxy to what a certain section of the football watching world thinks – Ladbrokes’ house advantage notwithstanding. But thats not the point anyways – I’ve just included them there for illustration purposes. So, am I crazy knocking off a well balanced Spanish armada and advancing the Samurai Warriors? Maybe. However, I do wish I had 2 – 3 bottles of Asahi right now with me as I type – I like that smooth brew. Anyway, I think that Christiano was wronged in the previous world cup and the universe has some debt to repay and that the Japanese are one of the best current examples of the sum of parts being much larger than the whole. Uruguay – Suarez and Forlan connect like crazy and the fact that they haven’t let a single one slip under the legs of their goalie clearly shows the class of their defending. Fucile’s perfect tackles help. S. Korea – I feel too much has been made of Park Chu Young, though that free kick was good and he is generally young and good. Their need to mend their fences re their defences think tank. USA – The intensity and toughness make up for the seeming lack of flair and talent. Ghana – Did they score goals in the group stage? Ghana and England (!) are the only two sides that have qualified into the 16 scoring just a brace during the group stage! Germany – Machinistic and moving the Jabulani well amongst each other. England – Actually I’m tentative re Germany vs. England that’s why have bet only 3 Jabulanis on this match. I think it could be 1-1 or 0-0 and then England will get KO on PKs. Argentina – Leo is one of the best, the very best in the world today. It’s the assists that he will provide that will work for me. Superstars dont always shine at the big stage – maybe they are overanalysed or that they are heavily guarded? Holland – The Oranje have potential – loads of it, but have not fired yet. But given Slovakia, I think it should be easy for them to move ahead and shape up only to sadly get shipped out by Brazil. Slovakia – Defences look weak. Although riding high on the win against Italy, I think one quick, early goal by the Oranje will get them to the ground and put their defence lines in disarray. Brazil – Fabiano is looking fab. Goalkeeper is the best on the pitch today. I think their reputation preceeds them and some lesser teams just make way for them. Chile – Would hate to see them lose to the Dungarees. I’ve always like this nation’s football – probably of the stars that played for this nation when I was younger! Paraguay – I know I am being contrarian dunking Paraguay for they are turning heads like crazy. Playing good fast attacking football. Japan – But they are also turning heads – not just of the watchers but also of the bricks in the wall as the Jabulani whizzes above and behind and into the nets during the Japanese free kicks. Spain – Probably the most talented team in the Cup, but its difficult creating a symphony out of too many whizzes. Somehow the midfield has not supplied enough to Fabregas. While Fabiano is looking fab, this one has not. So far at least. Portugal – They haven’t conceeded a goal. Draw out their talons and fight against the best and are not intimidated. And when they have faced poorer teams, they have absolutely crushed them. Maybe a long shot to the Cup but I think the Navigators will dribble around the Spanish Fury. Given fine balance I have allocated only 5 Jabulanis here. Now comes the tricky part of asset allocation. I’ll discuss some of these aspects in the investing pages later, when Jules Rimet has a new name emblazoned on his bottom. Jules Rimet Trophy really, he’d have to literally turn in his grave every 4 years to have a new country (or a repeat offender 😉 ) tatooed on his bottom if it really were that. Coming back (lack of beer makes me babble), I’ve put down more money (i.e. Jabulanis) on marquee names, dependable business and very less on the quarters onwards. If my bets are correct, then my longer term bets (on quarters onwards) should mulitply the winnings (if any) since the market has not yet started quoting on these anyways. I might just figure out a way to scale up based on the then extant odds and calculate how my hypothetical portfolio might have grown/shrunk, or might just down a few more asahis and forget about the whole thing! Why complicate matters when the real match is on….